Posted on 15. Jul, 2010 by Corey in All, Dayton Dragons Baseball, General Baseball. Jan from Huber Heights: I was driving down I-75 the other day, and saw the Dragons Charter Bus passing me going in the other direction. I assume the team was leaving for games on the road. I was wondering how all the equipment gets packed on the bus to travel with the team. Do you need to bring balls, bats, medical supplies, uniforms, etc? Jan, Thank you very much for emailing in that question. Yes, we are in charge of bringing everything that we need on the road to use during practice and games. The other team supplies us with drinking water, and that is about it. Each player must bring their full uniform and all the equipment that they will need from head to toe. In addition to individual equipment that the players need, there are also a number of items that the entire team uses. Medical supplies, baseballs, food, laundry bags, and other items, all need to be brought. All of the players pitch in to help carry this stuff when we leave Fifth Third Field. Before each trip, I will post a list outside of the manager’s office. On it are the duties each player is responsible for to help with for the road trip. I rotate duties so each player gets to help with different items for each trip. 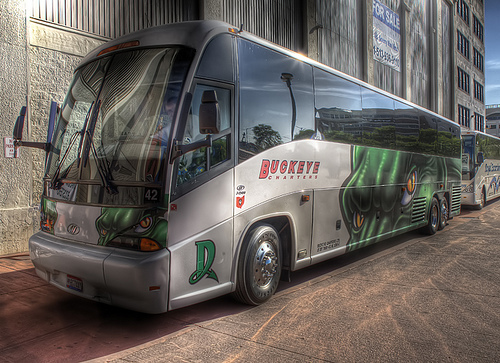 The bottom of the bus is usually filled with equipment and all the team’s personal luggage that they will need. So next time you see the bus rolling around town, you will know that it is probably stuffed for the road. If you have a question that you would like answered, please send it to me at corey@coreybrinn.com. Thanks! C wow what a great job you have! I wish i could come in help you for a day? I can clean shoes or put out water for you it would be so much fun to help you! maybe in a few years when you make it to the show Cincinnati i can take your job in Dayton?